Jade Emperor Pagoda has so many names. Try Jade Pagoda, Pagoda Ngoc Hoang, Chua Ngoc Hoang, Tu Hai Phuoc Pagoda, Phuoc Hai Tu, Phuoc Hai Temple or Da Kao Pagoda Seriously, it can drive you mad. Anyway, ask at your hotel desk to mark it on the map. Foreign Hai Phuoc Pagoda Jade Emperor. 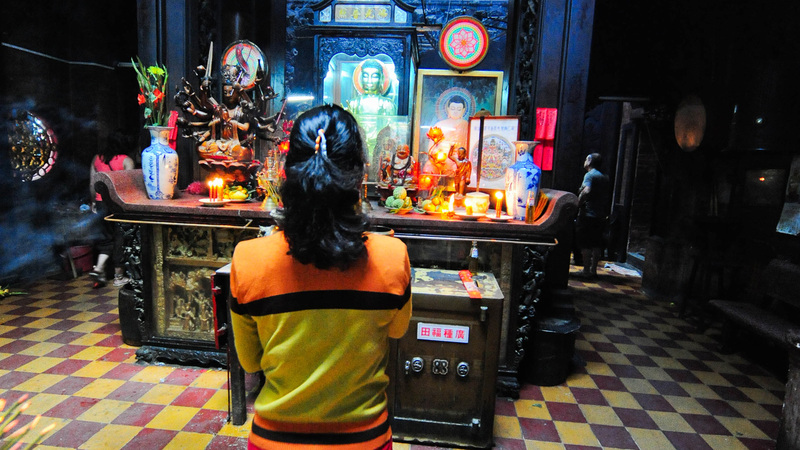 This temple is dedicated to various gods, Taoists and Buddhists of the China-Vietnamita culture and especially to the Jade Emperor, the Supreme of Taoism God. The facades of the Jade Emperor Pagoda are brick painted in pink without greater interest, major architectural and artistic attractions are the tiles and sculptures of roofs and above all, the doors of the temple carvings, authentic works of art and unique style Yin-Yang of the roofs. Just pass through the only door to the temple, Phuoc Hai Tu arrived at the courtyard, courtyard divided into 3 parts. In the first half of the courtyard of the Jade Emperor, we have a small turret with a statue of Ho Phap (Dharmapala) a Buddhist philosopher, after this first part of the courtyard is a small pond with turtles and benches for sitting, recognizable by the huge pot of banyan tree that is in the inside of the pond. Patio outside the Jade Emperor Pagoda. The last part of the courtyard, in front of the access to the inside of the Jade Emperor pagoda, have hand left the so-called incinerator, a chimney-shaped structure / boiler where believers burn offerings of paper, since according to religious beliefs, that smoke will reach to the ancestors and deceased in heaven. In that same place of the outside patio, but this time located on the right bank of the entrance to the Temple of Jade, we have shelter for turtles. Turtles in Asian culture represent longevity and are also considered in Vietnam as a symbol of fortune and good luck. At this small retreat at the gates of the pagoda, we have hundreds of these animals, which made value to this place the nickname of the Pagoda of the turtles. Undoubtedly the best of the Jade Emperor Pagoda is in the main building. Yin-Yang-shaped roofs are very striking, as well as being works of art. They have been constructed in several alturadas and completed with structures of red wood which are bound with green-colored ceramic tiles. 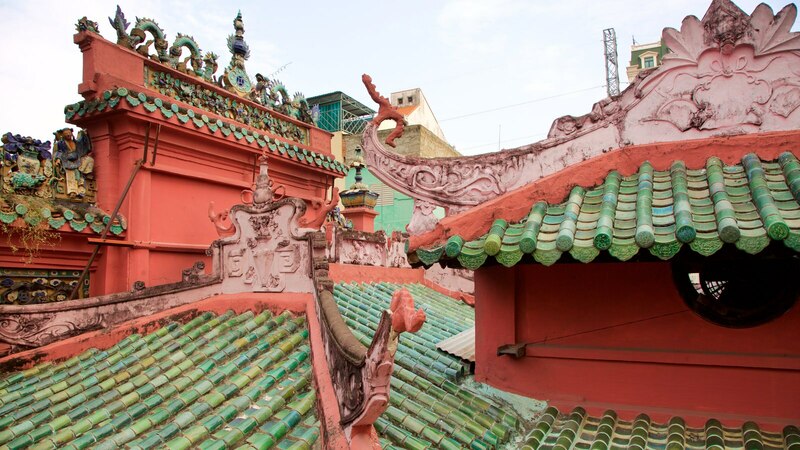 The roofs have characteristic sharp peaks and are sprinkled with numerous sculptures of dragons, symbol of the divine. 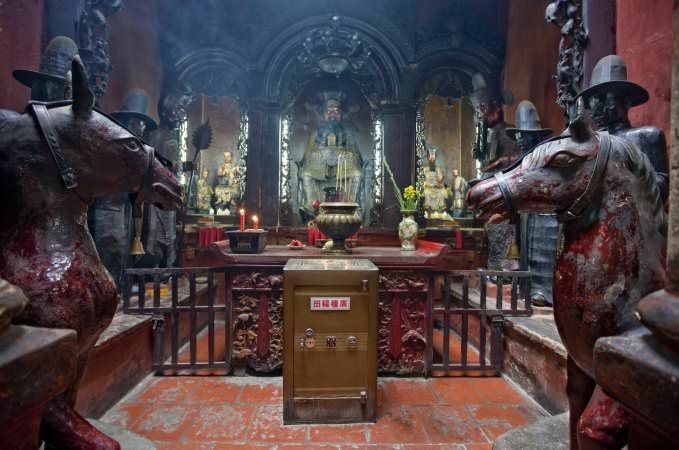 After passing through the impressive carved wooden doors with human and divine figures, have flanking both sides of the Jade Emperor pagoda 2 statues, which are the guardian of the gate (Mon Quan Than, to the right), and the guardian of the area (Tho day Than, to the left). At least he’s surrounded by a group of fellow gods, who not only dole out punishments for the wicked, but bestow rewards for good deeds as well. Here visitor will learn about the horses. The one on the right is for women, the left for men. It helps take the prayers to the gods. It’s an irresistible lure. Leaving behind the two guardians of Phuoc Pagoda Hai Tu, a small hallway where we can buy offerings and incense sticks and pay our respects to the Jade Emperor. Crossing the small Hall of the interior of the Jade pagoda came to call Phat Mau Chuan's altar or mother of 5 Buddhas, prelude to the most famous cockpit of the Jade Emperor Pagoda room of the ten Hells. 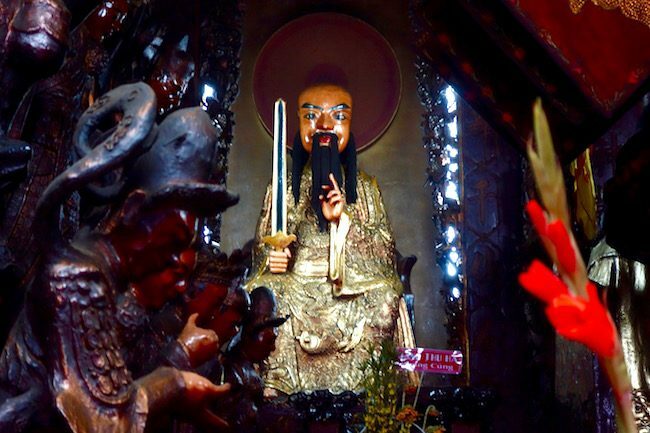 This last room of the pagoda is where the Jade Emperor, the god of heaven, statue easily recognizable by its large mustache typical Cantonese culture. 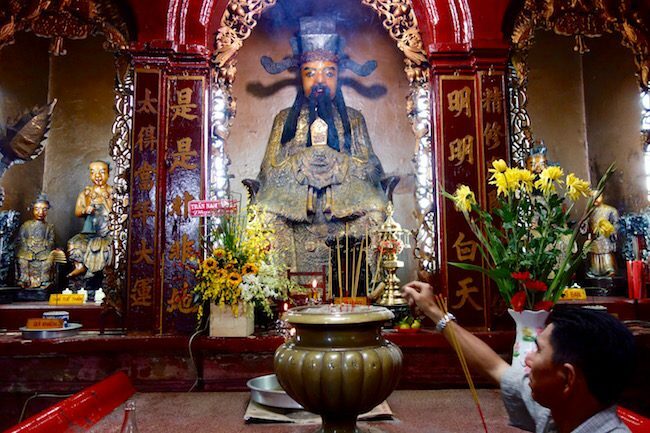 According to legend, the Jade Emperor decides who goes to heaven and who to hell. 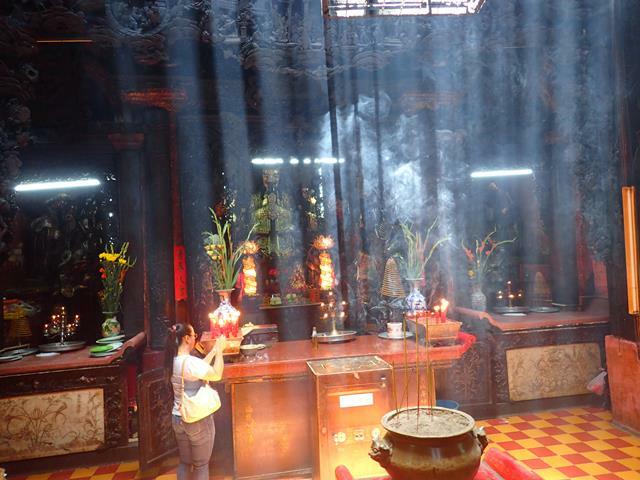 This room, the room of 10 Hells, is usually filled with smoke sticks of incense that placed the faithful who come to pray at the Pagoda, as well as multitude of candles, fruit offerings and called the lucky money. On the sides of this room we have panels carved with the representation of the 1000 storms, storms that have to withstand the evil people that resides in each of the 10 Hells. 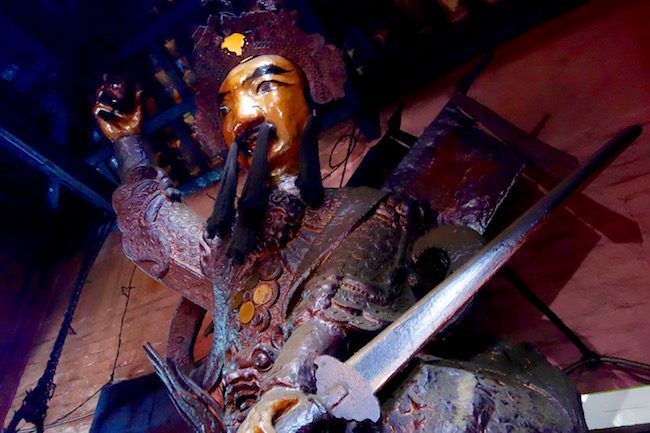 The Jade Emperor is escorted by 2 sculptures of Guardian demon Giants, sculptures of wood and papier-mâché 4 meters in height. 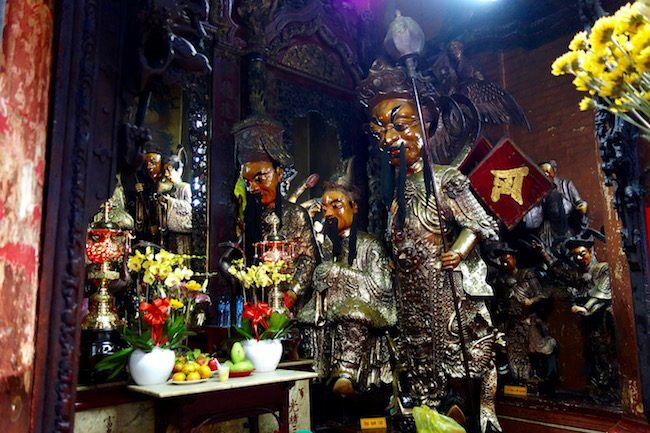 These demon guardians are known with the name of the large diamonds (Tu Dai Kim Cuong) in reference to its hardness. To the right of the room 10 Hells is the demon Guardian representing the general who defeated the green dragon, dragon that is under your feet. On the left the second demon Guardian, general who defeated the White Tiger, also under his feet. 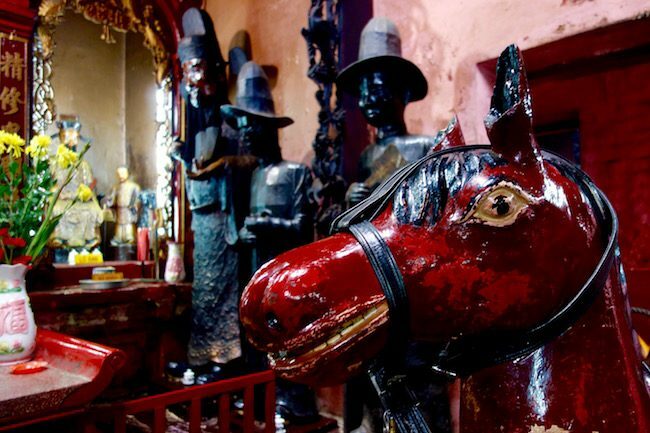 Hidden behind a door in the left margin of the Hells 10 room, we have a small camera with the statue of Thanh Hoang, the King of hell his red horse-mounted. In that same room, we have called women lounge, lounge with 2 rows of 6 women statues, representing the 12 months of the year. These statues of colorful clothes come normally Vietnamese women seek fertility to conceive children. 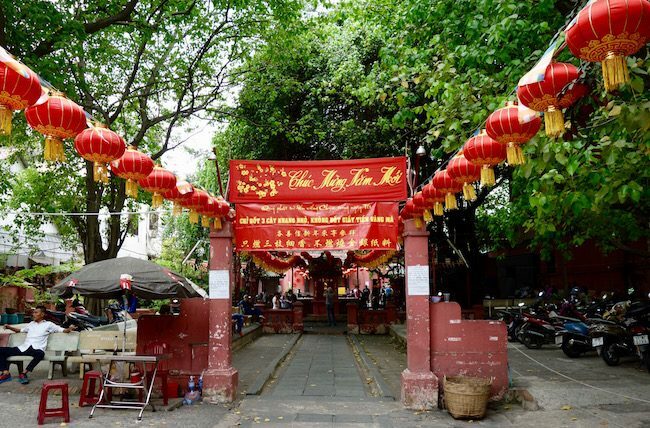 The Jade Emperor Pagoda is located in the calle Mai Thi Luu nº 73, at approximately 1 kilometre north of the Cathedral of Saigon, in the limits of the FISD 1 of Ho Chi Minh City. Due to its proximity to the center of the city of Saigon can go walk (approximately 20 minutes walk from Ben Thanh market) or by taxi (about 5 minutes ride with a price between 1€ and 2€). Another alternative of displacement until the Phuoc Hai Tu Pagoda are city buses. 36 And 54 buses have a stop in the vicinity of the pagoda. Gateway to the Jade Emperor Pagoda. The bus more convenient to navigate to the pagoda of the Jade Emperor is bus 36, which leaves from the Ben Thanh bus station (just opposite Ben Thanh market) and have to get us at the Tran Quang Khai Street (Trần Quang Khải). The 54 bus departs from Mien Dong bus station and the closest stop to the pagoda is the Vo Thi Sau Street (Vo Thi Sau). The Pagoda Phuoc Hai Tu of the Jade Emperor is admission free (donations accepted) and is open daily from 6:00 until 18:00. Dress Code: There are many tour groups to this shrine and try to be respectful.